The late entry fee will not be enforced now until the 9th September for Liffey Descent 2015. Please see here for the new updated form. Please email all applications to liffeydescent@canoe.ie. The Closing date for all entry forms still holds at the 16th September. 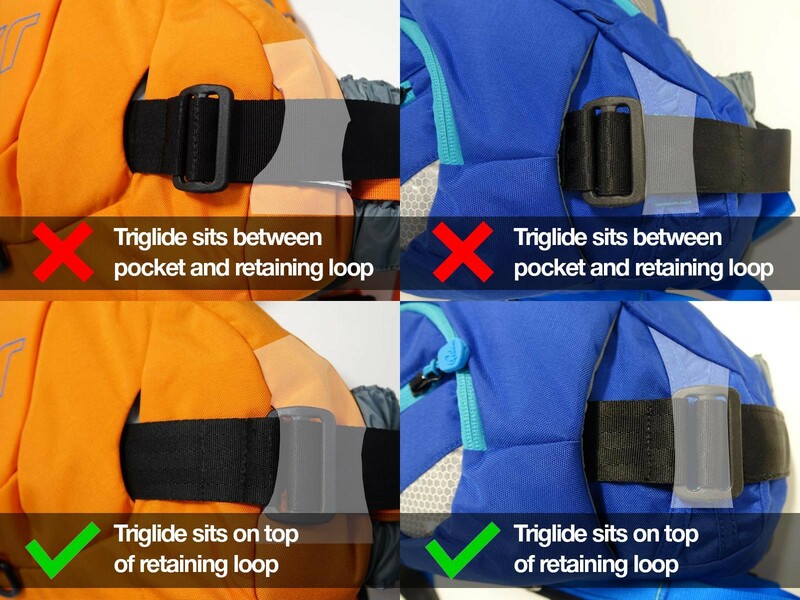 The wrong sized harness potentially allows the quick release buckle to move behind the PFD’s pocket, hindering the quick release mechanism. As a precaution we are asking both dealers and owners to carry out the following checks on the above PFDs. 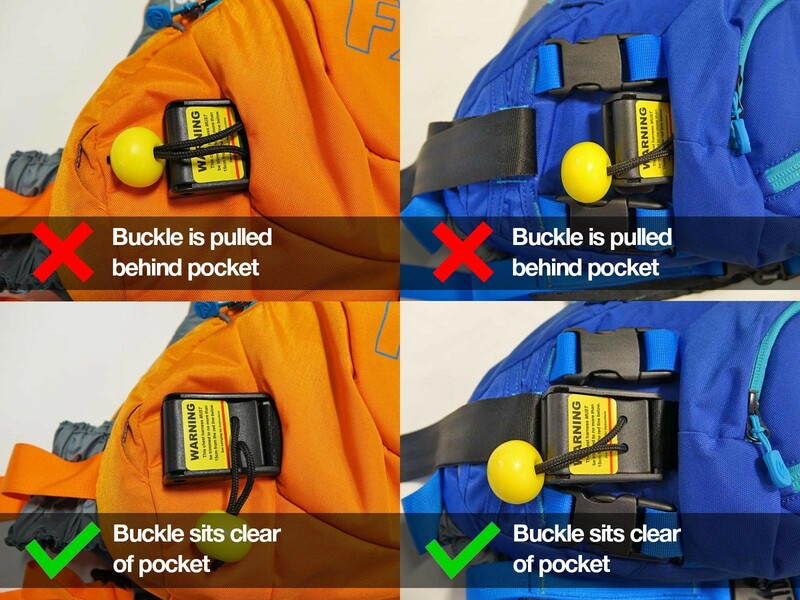 If you find that the quick release buckle is pulled behind the pocket, then remove the PFD from the shop floor and take the harness off. Send the incorrect harnesses back to us, we will cover postage costs. let us know how many replacements you need, by using the form below. 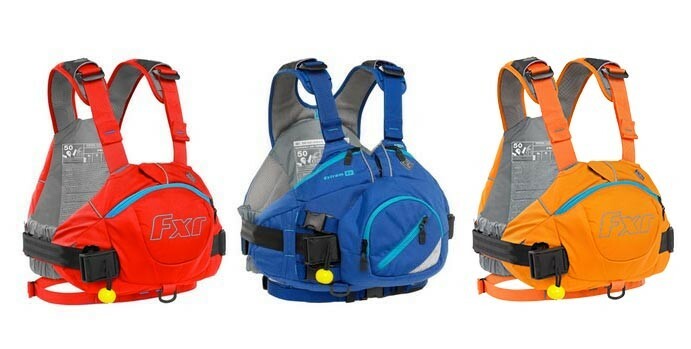 We will post you replacement harnesses within 10 – 14 days, which can then be refitted ready for sale. Please contact our sales department if you have any further questions. Please advise them to carry out these checks, and share this link where possible. They are still safe to use in situations when not using the quick release harness, or with the harness completely removed from the PFD. Thank you for your help, we are very sorry for any inconvenience. Copyright © 2015 Palm Equipment, All rights reserved. The River Safety & Rescue CPD is open to any trainee/qualified instructor in their respected discipline/qualification to develop both skills & teaching styles. 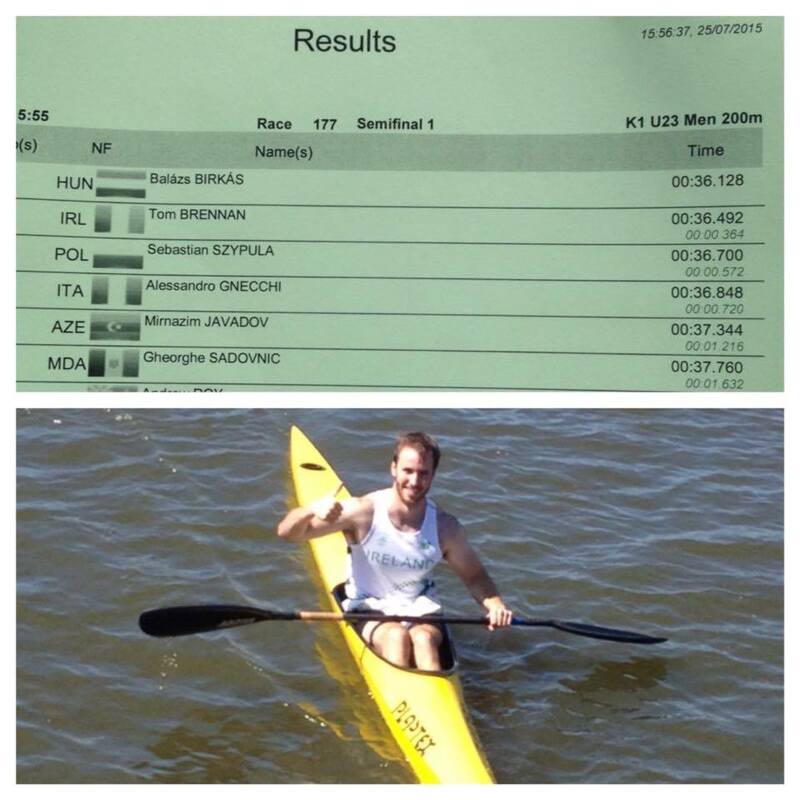 Jenny Egan 3rd in heats of K1 200m, Tom Brennan 5th in heats of K1 200m both qualified for Semi Final Canoe Sprint Ireland Canoeing IrelandOlympic Council of Ireland. Pat O’Leary raced earlier today coming in 9th in the final. Date: Saturday 29th August 2015. K4 Open mixed with 1 Senior/U23, Junior, Master, and Female per crew to provide equal crews where possible. Clubs may enter as many crews as possible and combine clubs. Payment by PayPal: https://www.paypal.com/ie/webapps/mpp/home click send from drop down menu. Enter canoesprintireland@gmail.com and enter amount. Pay by credit card or PayPal account, make sure you use a reference. Event Details: ICF standard Canoe Sprint 9 lane regatta course. K1 heats will be open and may be seeded for all classes (males, females, juniors) combined based on past history, performance, etc., at the organiser’s discretion. Times will determine qualification to Finals. We are also looking for volunteers and more sponsors to help out on the day. Please contact canoesprintireland@gmail, performance@cani.org.uk, or David Pringle 0872480055 if you are willing to help. All K boats must comply with ICF rules regarding boat weight standards ie 12 kg for K1 and 18 kg for K2. Clubs should nominate a Team Leader for the regatta who can liaise with the race organisers. There will be a team leaders meeting at 9:30am on Saturday at the regatta course. All paddlers should be on site by 10.00. The timetable is very tight so please make sure that all paddlers and crews arrive at the start line in good time (at least 5 minutes) before their race is due to start. The starter will not wait if paddlers are not in the start area when called. 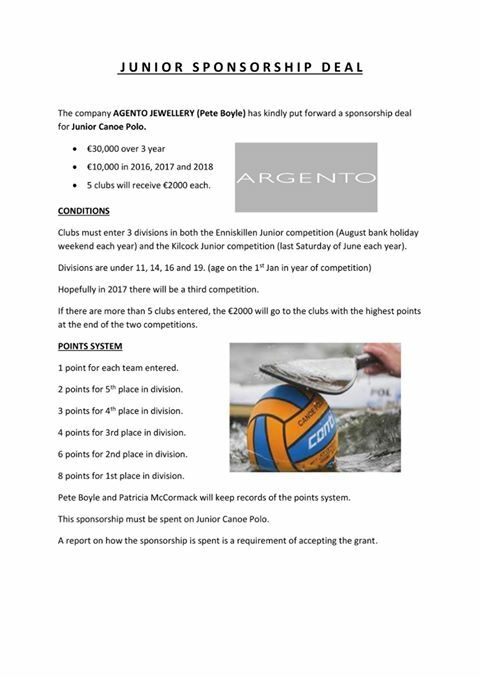 Closing date for entries is Tuesday 25th August – please make sure that your club entries arrive in good time. National Sprint Championship titles will be awarded to the first Irish paddler both male and female in the K1 class 1000m, 200m and K2/K4 Class finals – see below. Entries will also be accepted in the K boat classes from paddlers who wish to paddle other types of boats eg sea-boats, down river or wild water boats, provided they do not exceed maximum length for K1 of 5.2m or for K2 of 6.5m and exceed the minimum weight. Lightnings/Guppies will be used by multiple paddlers and must be returned immediately after use. Please wear club colours/tracksuits for medal ceremony’s which will take place throughout the day. The team is managed by Ciaran Farrell and coaching support is provided by Eoin Rheinisch, Marc Jegou and Matt McKnight. 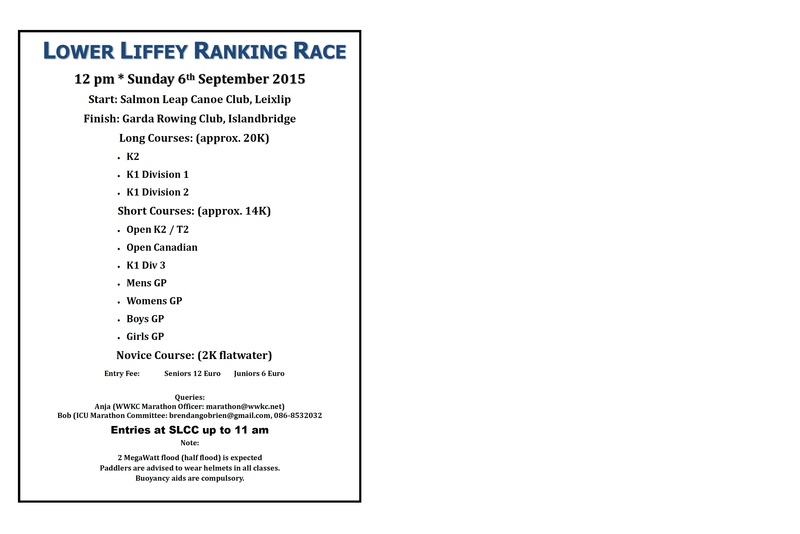 Blurb from Kilkenny Aqua Canoe Club’s race on Wednesday 19th August. 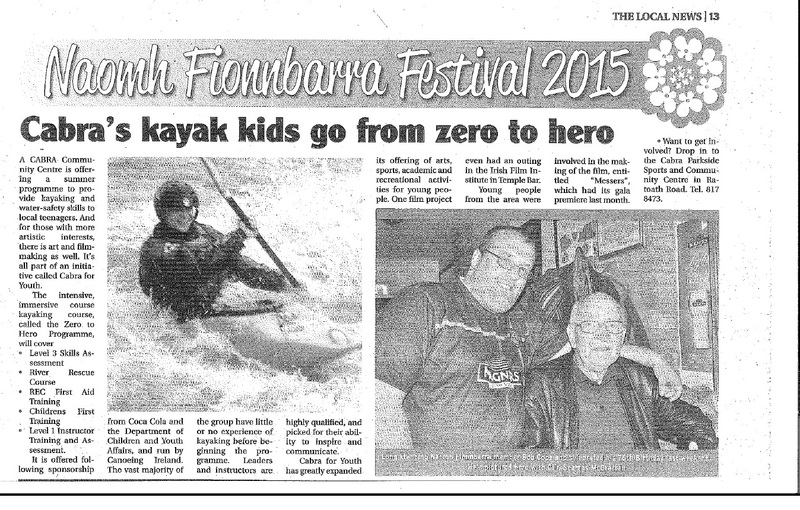 Yes it’s that time of year again, Junior Paddlefest is on the 19th and 20th September 2015. Junior Paddlefest is now the largest Junior Kayaking Event in Europe and has won Outsider Event of the Year several times thanks to the tremendous work of the event organisers and the generous voluntary support of our network of instructors, coaches and trainees over the years. This year we are again recruiting volunteers and asking for your help to continue the massive success of this event by repeating the fantastic sessions that make the event so unique and entertaining for the kids who take part. This event is a great opportunity for trainee instructors and coaches to log a large number of hours with a great variety of qualified individuals over a short 2 day period. If you are available and interested in helping out please fill out the volunteer registration form by going to the following link:http://canoe.ie/junior-paddlefest-volunteer-recruitment and we will send on all of the final details closer to the event. This event is a great opportunity for trainee instructors and coaches to log hours and gain experience. Please note that volunteers must make their own accommodation arrangements with the Hidden Valley campsite if staying overnight, www.irelandholidaypark.com . The 1st of September is fast approaching which means the late entry fees will apply to your 2015 Liffey descent entry. Make sure to get your application into the Liffey Descent committee on liffeydescent@canoe.ie or post your application to Canoeing Ireland, Irish Sports HQ, National Sports Campus, Blanchardstown, Dublin 15. The Shannon has always attracted paddlers from near and far. With the ongoing Blueways Ireland developments on the Shannon by Waterways Ireland it is inspiring to see and hear of the river being used more and more. Thanks to David Horkan from Paddle & Pedal there is now an official Shannon record and a challenge for people to conquer. A great expedition and super write up below. Species Alert for: Crayfish plague (Aphanomyces astaci). Reason for issue: Preliminary DNA diagnosis shows Crayfish plague as present on the Bruskey/Erne River at Killydoon, near Ballinagh, Co. Cavan. As a result of native White-clawed Crayfish mortalities being reported to Inland Fisheries Ireland in July 2015, IFI initial site investigations have found 600+ dead native White-clawed Crayfish. Specimens of the dead crayfish were DNA tested and the Crayfish plague, a water mould disease, was confirmed. Summary of potential impacts: Establishment of the crayfish plague could result in 100% mortality of the protected native White-clawed Crayfish (Austropotamobius pallipes). Throughout its European range, this species has been decimated by the impact of Crayfish plague disease which spread to Europe with the introduction of the plague carrier North American species of crayfish. The implications of this disease occurrence are extremely concerning to NPWS and Inland Fisheries Ireland. If crayfish plague becomes established there is a high probability that the native White-clawed Crayfish will be eliminated from much of the island. Worse still would be the establishment of non-native crayfish as the experience in Britain and Europe has been that these species have very severe impacts on habitats and other species. One potential impact could be on salmon and trout fisheries and the loss of the tourism revenue from these fisheries. Become familiar with the identification of the native and non-native crayfish: view crayfish identification tips. Immediately report all suspected sightings of non-native crayfish or dead native White-clawed Crayfish to coflynn@biodiversityireland.ie or through the online form. Please supply the date of sighting, location name, location coordinates and your contact details. If possible, please supply a photo of the crayfish showing the underside of the claws to aid in verifying the sighting. Do not release any non-native crayfish into Ireland’s waters, it is illegal to do so. Please circulate this species alert as widely as possible. Invasive status: Crayfish plague is listed as one of Ireland’s most invasive species by Invasive Species Ireland. This species is listed by DAISIE as among 100 of the worst invasive species in Europe. All non-native crayfish, which may be carriers of the crayfish plague, are listed on the Third Schedule Part 2 of the European Communities (Birds and Natural Habitats) Regulations 2011 in Ireland. Five non-native crayfish that have gone through a detailed risk assessment process are each assessed at MAJOR risk of impact to Ireland see:http://nonnativespecies.ie/risk-assessments. Introduction status: Established but localised. This species is currently confirmed from just one stretch of river. Is there a reference specimen? : Yes. Specimens taken and tested for the DNA plague. Pathway of introduction: Either through introduction of an infected American crayfish species or through infected fishing gear. How the disease got to the Bruskey River and whether it has spread from the initial area of infection is currently under investigation by NPWS and IFI. Either the disease was introduced accidentally on contaminated equipment (e.g. wet fishing gear or boots used recently in affected waters in the UK or elsewhere) or else non-native species have been illegally introduced to the area and have now passed the disease to the native White-clawed crayfish. If the disease outbreak was accidentally introduced on contaminated equipment then containment may be possible, but if non-native crayfish have been introduced then the disease is likely to become established with severe and probably irreversible ecological impact on Ireland’s freshwater fauna and flora if not acted on immediately. Site inspections to assess extent of native White-clawed Crayfish mortalities and to collect specimens for analysis was undertaken in July, 2015. DNA analysis of the collected dead White-clawed crayfish specimens give a preliminary diagnosis of the Crayfish plague. A more thorough analysis will be undertaken to confirm the disease. Additional site inspection surveys ongoing. Last World Cup of the season, on one of our athlete’s favourite courses! We have Hannah Craig, Liam Jegou and Oisin Farrell Racing. Oisin races at 16:05, (15:05 Irish time) and Liam Jegou races at 11:53 (10:53 Irish time) and Hannah Craig in K1 is racing tomorrow at 2.45pm Irish time. Races 8 & 9 in the ECA Junior Cup series were held over the past two days in Ceske Budovice, Czech Republic with Caoimhe O’Ferrall taking first place in the final of both races in the U18 C1W category ahead of competitors from Germany, Slovenia, Kazakhstan and Sweden. This followed her 3rd placing in race 7 of the series last weekend in Solkan, Slovenia. Women’s C1 is an ICF development class which will be introduced in the Tokyo Olympic programme for 2020. 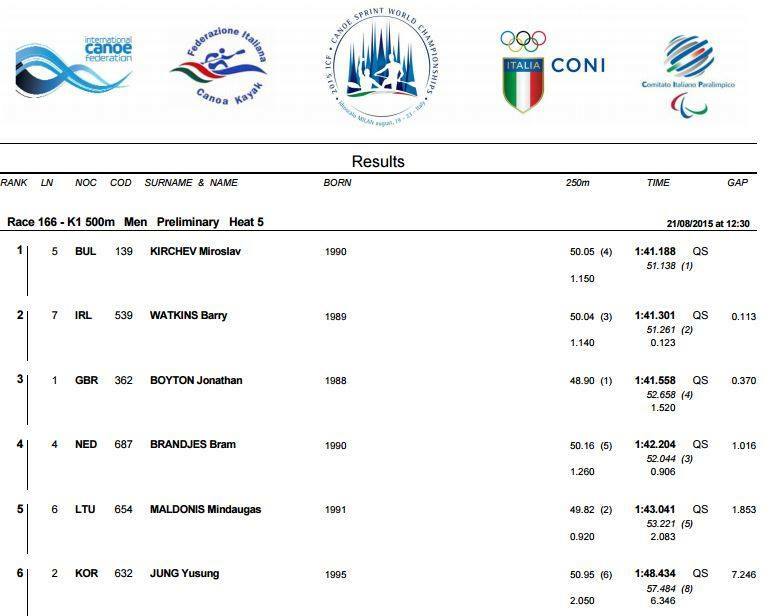 It is great to see Caoimhe progressing in what is one of the most technically difficult classes in canoe slalom on such challenging courses. Ciara Farrell came in 26th position in Thursday’s K1W U16 race missing out on a top 20 place which was required to progress to the final. This followed her 15th placing in Solkan last week behind Jessica Harkin in 14th place. These Junior Cup races provide valuable experience for young Irish paddlers being introduced into international competition. The final two races of the series are in Krakow, Poland next weekend with Cillian O’Ferrall, K1M U23, Noel Hendrick, Darragh Bergin and Cian Vaugh, K1M U18, Ciara Farrell, K1W U16, Caoimhe O’Ferrall, C1W U18, Robert Hendrick, C1M U18 and Noel and Robert Hendrick in C2M U18. Also next weekend we have Race 4 of the Senior World Cup series in La Seu d’Urgell, Spain where we are represented by Hannagh Craig in K1W, Liam Jegou in C1M and Oisin Farrell in K1M. 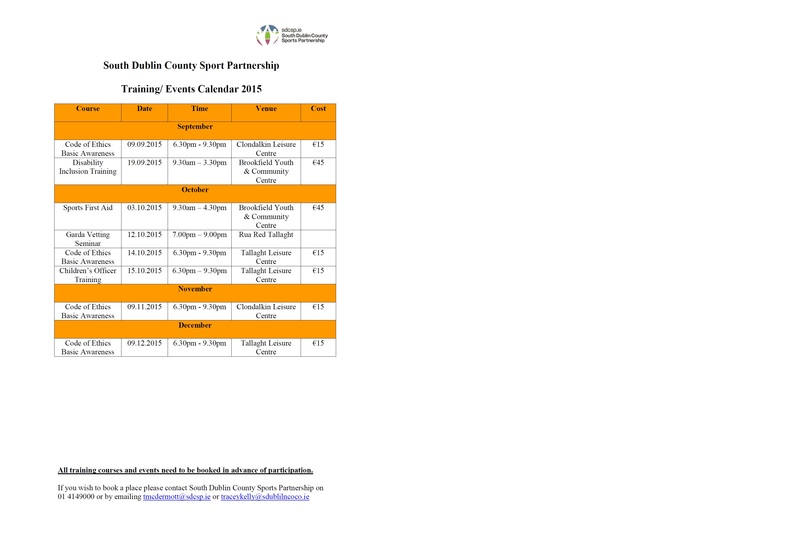 So a busy week ahead and good luck to all…..
Thomastown Canoe Club will be hosting a competition this weekend, email irishmarathoncanoeing@yahoo.com for more details. Race organised under the auspices of The Irish Canoe Union Marathon Committee. A raffle for canoe gear will be run with proceeds to O’Neill Centre. Please go to http://canoe.ie/liffey-descent/ for a copy of the application form. Can you please circulate the details below details for our Garda Vetting for Sports Clubs Information Seminar?Garda Vetting for Sports Clubs Information Seminar on Monday, 12th October from 7.00pm – 9.00pm in Rua Red, South Dublin Arts Centre, Tallaght. Did you know that due to new legislation it will be illegal for any volunteer or coach to work with children or vulnerable adults on a continuous basis before successfully completeting the Garda Vetting process? Who will need to be Garda Vetted? What action should the club take now? Whose responsiblity is it to ensure vetting is carried out? Admission to this seminar is free but places are limited. This course follows the Sella River betwen Arriondas and Ribadesella bridges (20 Km.) in Asturias (Spain). The Cadets, Centenarians, and Mixed categories as well as the RR types, have their Finishing Line at the Llovio railway bridge (15 Km.) where the river estuary begings and where the outdoor lunch and festivities are held. The Senior, Junior and Veterans categories (Men and Women in K2, K1, C2 and C1)) have their Finishing Line at Ribadesella (20 kms). Junior Wildwater Racing World Championships 2015, Nantahala River, North Carolina, USA. 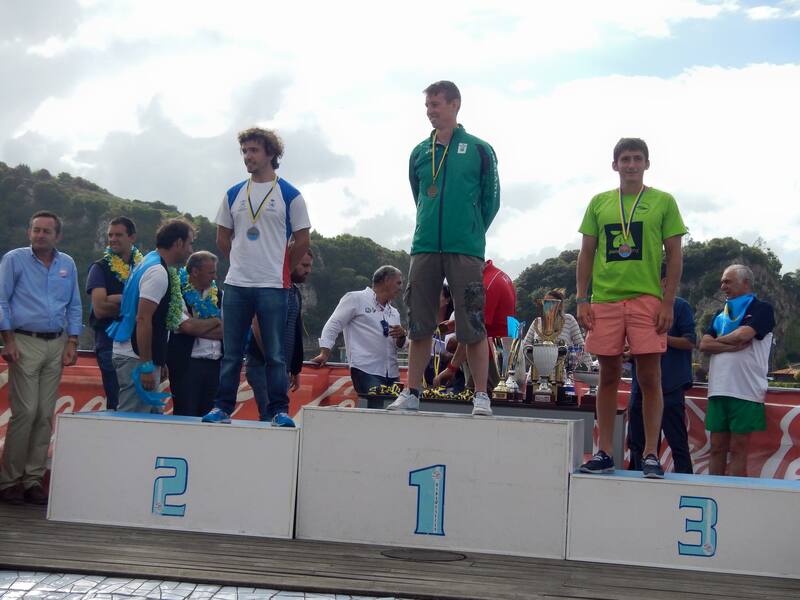 Ireland has had its most successful ever Junior Wildwater Racing World championships (three boats reaching the finals! ), with Cian and Darragh Clarke finishing 5th in junior C2 (equal highest finish for Irish junior at world championship event with Lorcan Feely who finished fifth in the 2009 Junior Worlds in men’s junior kayak), Darragh Clarke finishing 9th in junior C1 and Craig Cummins finishing 13th in junior men’s kayak, Mollie Claffey securing 20th place in women’s junior kayak and Cian finishing 26th in men’s junior kayak. One of the most pleasing aspects of watching the results come in was to see how all three finalists improved significantly between qualification and the finals. All four paddlers have another year left in the junior ranks which augurs really well for the future. River Liffey, Island Bridge, Dublin. The Liffey Odyssey is being organised to raise much needed funds for Barretstown House. It is being hosted by I-Canoe and organised by the Liffey Odyssey Group comprising of representatives from a number of canoeing clubs (Lucan Kayak Club, LIR KC and WWKC). The event is being run as a Canoe Tour from Islandbridge to East Link Bridge in Dublin Port with the aim to have a fun and leisurely paddling trip down the Liffey. Fancy Dress is strongly encouraged. Open Canoes are the preferred craft however participants may use sit -on -tops, rafts, stand up paddle boards or any other craft that involves a paddle. The event is open to club and individual canoeists who should be at minimum Canoeing Ireland Level 1 ability and who satisfy the organisers they have sufficient ability to participate . Participants are expected to supply their own boat – preferably an Open Canoe but there may be a limited number of places available in Open Canoes to anyone who cannot supply their own – contact Paul Carroll for availabilty. All participants must wear an approved Buoyancy Aid, helmet and appropriate footwear and and suitable clothing e.g. wetsuit or similar. The event is open to children over 8 – however all children under 14 must be accompanied on the water by a parent or guardian. Children over 14 must be accompanied by a competent adult paddler. All participants under 18 must have written parental permission to participate. As the event is being run to raise funds for Barretstown we are asking you spread the word and get your friends and work colleagues to make a donation to Barretstown. Donations can be made to http://www.mycharity.ie/event/liffeyodyssey2015/.